A creative professional whose exemplary work has been recognized in trade publications, awarded at competitions and praised by legions of loyal clients since 1994, Kristin is continually honing her skills as a Cassandra Editorial Designer. Never missing an opportunity for advanced education, Kristin has traveled extensively throughout North America and Europe to stay current with the most up-to-the-minute trends in beauty and fashion. 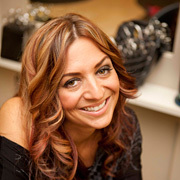 Known for her artistry in haircutting, perfection in “finish work” and special event upwork, Kristin also specializes in multidimensional and transforming color techniques, Bio Ionic Straightening, makeup artistry and as a certified Hair Dreams technician, hair thickening and lengthening. As an Editorial Designer, Kristin plays a key role in the education of new talent joining the Cassandra family, introducing her charges to a skill-level that goes beyond traditional education. Organized and prompt when it comes to her work, Kristin finds rejuvenation through her family, devoting precious quality time to her husband Luke and children Liberty and Blake.